Oldest Iron Age gold jewellery found in Britain - Leekfrith Iron Age Torcs. Mark Hambleton and Joe Kania uncovered three gold necklaces and one bracelet in Staffordshire. The collection has been named the Leekfrith Iron Age Torcs and believed to be around 2500 years old. It features some earliest Celtic art ever discovered. 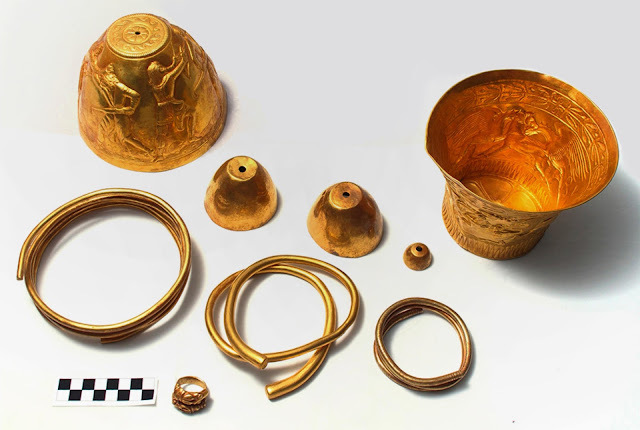 The items were found close together, the reason why they were buried is not known, possibilities are an act of remembrance after their owner died, for safekeeping or an offering to the gods. Dr. Julia Farley, curator of British & European Iron Age collections for the British Museum says that the torcs were probably worn by wealthy and powerful women. Piecing together how these objects came to be carefully buried in the Staffordshire field will provide invaluable insight into life in Iron Age Britain.